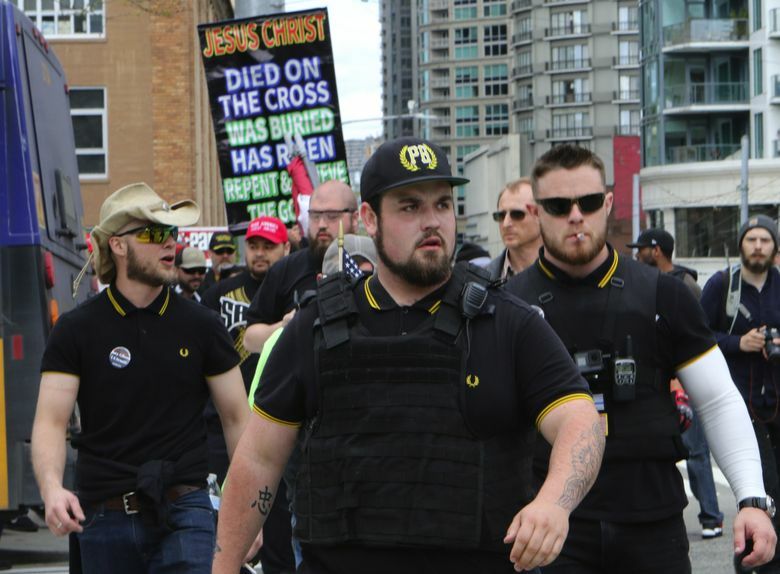 The Proud Boys, a right-wing men’s group, is claiming a higher profile role in the region, with two members involved in a confrontation outside the Vancouver Mall that raised concerns for some about a miscarriage of justice. VANCOUVER, Clark County — Mykel Mosley walked out of the Vancouver Mall and saw something that made him angry: a pickup flying what he says was a Donald Trump flag. The African-American teenager yelled out an obscenity about Trump. Two men got out of the truck, and chased Mosley, one of them spinning him briefly to the ground. A video, posted online, shows some of the May 11 confrontation and its aftermath — including Mosley’s being turned over by mall guards to police who arrested him. The man who grabbed Mosley was identified by the Clark County prosecuting attorney as Tusitala “Tiny” Toese. Another man, Donovon Flippo, through a posting from his Facebook account, says he joined in the pursuit of Mosley. Within the past year, the Proud Boys, launched in 2016 by Gavin McInnes, the co-founder of Vice Media, has elevated its Pacific Northwest profile. Members often are savvy users of social media and take part in right-wing rallies sponsored by Patriot Prayer, including one in February at the University of Washington in Seattle. They have been involved in scuffles with anti-fascist “Antifa” activists, most recently a June 30 Patriot Prayer march in Portland that police declared a riot after violence erupted between demonstrators and antifa counterprotesters. During the Portland march, Antifa protesters tossed eggs, half-empty water bottles and firecrackers at the marchers, according to The Oregonian. Marchers used flagpoles to strike people and some kicked and hit a man on the ground, according to David Neiwert, a Seattle-based journalist and author who writes for the Southern Poverty Law Center — which monitors extremist groups — and was at the event. The Proud Boys’ conduct is raising concerns about assaults and intimidation by a group that feels emboldened by the Trump presidency. Those concerns were outlined in a letter sent to the Clark County prosecutor June 25 from the leaders of the Western States Center, a Portland-based nonprofit that works to promote racial, social and economic justice. “The Proud Boys have been involved in numerous violent incidents in Oregon, Washington and across the country … leaders and members regularly spread white nationalist memes and make overtly bigoted statements,” wrote Western States Center executive director Eric Ward and Board Chair Scott Winn. Toese was under arrest at the time of the Portland rally. But he used a Facebook video to offer praise of those who did attend: “You guys delivered a message … Try to mess with my freedom and I will knock you to the ground,” he declared in a Facebook video. Toese has emerged as one of the most well-known Proud Boys in the region, a stalwart of Patriot Prayer rallies. In one video posted on his Facebook account, he drives around in an open-top vehicle flying an Antifa flag with boasting of an anti-gay slur scrawled on it. He says he is headed from Vancouver to Portland, a left-wing stronghold. “Want some, come get some, ” Toese taunts. The Seattle Times was unable to reach Toese for a comment on this story. In videos posted to his Facebook account and elsewhere online, Toese, who is American Samoan, portrays himself as a kind of freedom fighter, a person of color who is part of a besieged conservative minority in this region. At rallies he is sometimes introduced to speak by Joey Gibson, the Southwest Washington-based founder of that group who is running as a Republican this year for the U.S. Senate seat held by Sen. Maria Cantwell, D-Washington. In Seattle, he talked about what he says was his transformation from Trump hater to Trump supporter, a change he says was partly due to one of Gibson’s online speeches. In connection with one of the Portland rallies, Toese was arrested in December 2017 on investigation of disorderly conduct, harassment and assault. He pleaded guilty to harassment and was sentenced to 40 hours of community service, according to court records. 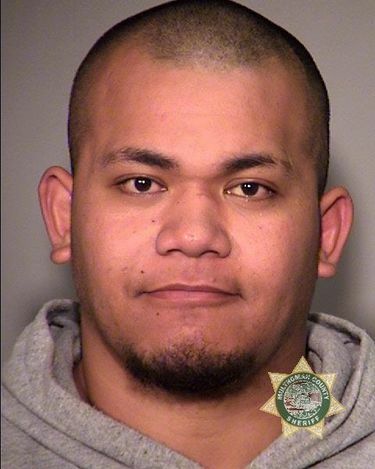 On June 30, before the start of the Patriot Prayer rally, he was arrested as a result of a criminal investigation that dated to a June 8 incident, according to Sgt. Chris Burley, of the Portland Police Bureau. On that afternoon in northeast Portland, Toese, 22, and Flippo, 23, were yelling a favorite slogan of the president — “Build the Wall” — while stopped in a truck at a traffic light, according to Tim Ledwith, who was walking nearby. Ledwith said he had protested Patriot Prayer rallies, and recognized Toese. He made clear to the men he was no Trump fan, he says, waving his hand in a dismissive gesture. Words were exchanged. Toese and Flippo got out the truck, Ledwith said. Days later, Ledwith saw the video of the Vancouver Mall incident. When he learned from Western States about the teenaged Mosley getting charged, Ledwith decided on June 12 to report his alleged assault to the Portland police and submit photos of his bloodied face. The Multnomah County District Attorney’s office is investigating the June 8 incident and has not yet decided whether to charge Toese and Flippo, according to Brent Weisberg, a spokesman for that office. The May 11 incident at the Vancouver Mall has not resulted in any charges against Toese. Mosley — the teenager he pursued — was held for several nights in a juvenile-detention center as a “threat to public safety, according to Clark County court records. Some of the incident is captured in a jumbled series of video clips shot by a friend of Mosley. There is talk about the “Trump flag” that flies from the truck, which is sometimes visible as a blurred image in the distance. The video is filled with a frantic, often profane narration from Mosley’s friend. She posted it online. Then the video clips, spliced together and out of order, were reposted on a right-wing YouTube channel where they have been viewed more than 200,000 times. As the disturbance unfolded, mall security guards were in the parking lot as a man chased and accosted Mosley, who ended up on the ground, then quickly got back up to his feet, the video shows. The security guards appeared to conclude that Mosley was the biggest problem. They pursued the teenager and eventually placed him in handcuffs, the video shows. A woman who appeared to have entered the fray to take Mosley’s side also was handcuffed. J.B. Schutte, the mall’s general manager, said the security guards did their best to de-escalate the situation. Prosecutors charged Mosley with criminal trespass for allegedly refusing to leave the mall property and two counts of third-degree assault for allegedly punching two mall security officers, according to Clark County court documents. Toese was not named in the arresting officer’s declaration. There was only a reference to a “unknown citizen” involved in a disturbance with Mosley, who was then 17 but has since turned 18. Mosley’s case drew the attention of the Western States Center. “After the alleged assault by the Proud Boys, security and law enforcement engaged on the side of these far-right actors rather than the youth of color they had targeted,” wrote Ward, the center’s head, and board chair Scott Winn in their letter to Clark County County Prosecutor Tony Golik. They asked Golik to drop the felony charges against Mosley. On June 29, Golik did. His office explained the decision in a court filing as “in the best interests of justice.” His office also dropped charges that had been filed against the woman who intervened on Mosley’s behalf, court records show. Golik, in an interview with The Seattle Times, said security guards’ statements to police were not consistent with what he saw in video clips of the event. Golik said the case has been referred to the Vancouver city attorney for a review of possible charges against Toese. Mosley told The Seattle Times he was relieved the charges were dismissed. He wants to put the incident behind him and move on. Editor’s note: Due to the number of comments on this story that violated our Terms of Service, the comment thread has been closed to new comments.